Sim Bhullar, we’ve been waiting for you. I have been quite certain for the last 20 years or so that there was an excellent chance I would die without seeing an Indian play an NBA game. I have been proven wrong, with hopefully some years in my life to spare. 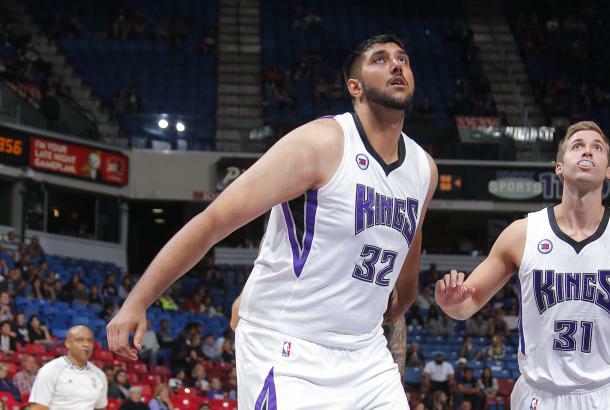 The gargantuan Bhullar, a star high school and college basketball player originally from Toronto, has been signed to a 10 day contract with the Sacramento Kings- owned by Indian-American Vivek Ranadive. This is huge for Indians, and not just because Sim is 7’5″ tall, and pretty wide too for our generally anemic and too often sadly malnourished race. In fact Sim’s width exceeds the height of many fully grown Indian men. There are players in the NBA from around 80 countries since the last decade or so, when international players became commonplace in the NBA. Till now there have been none of Indian descent. Sim was originally a late draft pick for the Kings last year, but was cut before the 2014-15 season began and thus did not truly complete a stint in the NBA yet. He was sent to the developmental league where he did well enough to get called back up to play with the big boys. Sim has been known to have issues regarding speed and conditioning. Some work in the gym, especially with weights and cardio, should help him immensely. While a 10 day contract is tenuous at best, like a girl who reluctantly decides to go on a date with you only because you are her BFF’s brother, Sim now has a chance to prove that he belongs in the NBA. There is no question that interest in the NBA, and in basketball in general, will now explode all over India and the Indian diaspora. Farmers in the countryside will start building hoops on their land for the first time, ever. The NBA has been smart in marketing to Indians- and expanding globally in general, helping make it a truly global league unlike any other American sport. In a few years we predict there will be more players of Indian origin joining the league. 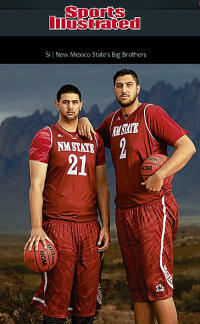 Sim’s little brother (as in 7’3″ little) Tanveer just may be one of them. Posted on April 3, 2015, in Commerce, Culture and tagged Indian-American, Indo-US, NBA, Sim Bhullar, Tanveer Bhullar, US-India. Bookmark the permalink. 1 Comment.